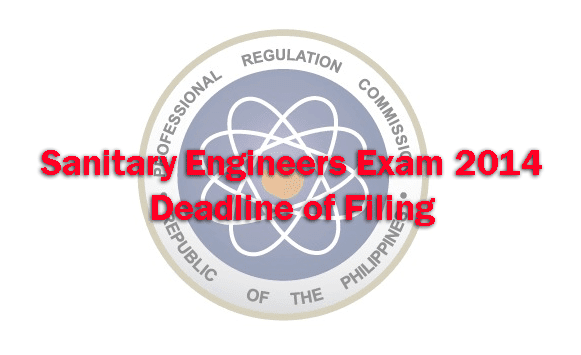 Manila, Philippines – The Board Licensure Examination for Sanitary Engineers (BLESE) was rescheduled as announced by the Professional Regulation Commission (PRC). The schedule will be on August 26, 27, 28, 2014. Those who are bound to take the examination will have to know the real schedule to avoid inconvenience. The reason for the rescheduling of the said examinations is Iglesia ni Cristo’s centennial anniversary celebration that happened to be on July 27, 2014 which is the schedule of BLEPT that is why the Professional Regulatory Boards for Professional Teachers, Medicine and Sanitary Engineering recommended the adjustment of the schedule. For Sanitary Engineer, it will be from August 12, 13, 14, 2014 to August 26, 27, 28, 2014 and the deadline of filing is on August 6, 2014. Physicians Exam Deadline of Filing is Here. Teachers Exam Deadline of Filing is Here. Take note of the new schedule of examination and prepare the necessary requirements so that problems that may arise during the examination period will be avoided. Above all, it is important to refer to the PRC website to know if there are any adjustment on the schedules done.